These days, 3D printers can create just about anything – from human organs to deadly weapons. But one innovation we haven’t previously seen in 3D printing? Printer filament made from of planet-friendly materials rather than Earth-damaging plastics. That’s changing however, with design firm Emerging Objects‘ recycled and recyclable 3D printing materials. Using materials like salt, concrete, wood and paper, they are putting the green in 3D printing. Traditional 3D printing requires decidedly environmentally-unfriendly materials like thermoplastic and photopolymers. That’s a lot of plastic being produced and put out into the environment that isn’t going anywhere anytime soon. So Emerging Objects decided that it was time to find printing material that wouldn’t languish in a landfill. 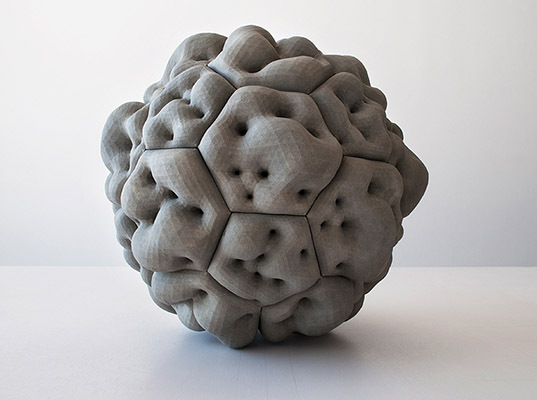 The team, founded by Ronald Rael and Virginia San Fratello, has experimented with materials as basic as salt and as complicated as a concrete polymer that can create an object that is even stronger than traditional concrete. They’ve also created a printing material out of woods like recycled maple and architectural wood waste composite, and out of good old fashioned paper. The result is printing technology that can create beautiful items out of green materials. The team can even produce printed objects out of wood that actually mimic the grain of traditional wood. The printed items are also incredibly strong and, perhaps best of all, the printing material is much more affordable than traditional plastics, which means that you can now have options when choosing your 3D printing materials. The most-used material in 3D printing is Poly(Lactic Acid), a fully biodegradable thermoplastic that can be made from common plant starch or sugar, which has excellent dimensional stability in printing and biodegrades about as fast as wood. It is not merely environmentally friendly; it is not merely non-toxic; your body is actually capable of tearing it apart for energy, which is why it is often used in medical sutures today, along with a similar but lower-melting-point bioplastic PolyCaproLactone, which can also be used in 3D printing, but is less useful for mechanical parts. Emerging Objects seem to be showing materials used in bonded powder 3D printing, and doesn't tell us what binders they use to stick those materials such as powdered wood together, so for all we know it could be a toxic resin, while they are also printing things in Nylon and Acrylic, and concrete is not entirely an environmentally-friendly material, since it uses very-slow-renewing limestone and releases CO2 when used. Meanwhile, wood-impregnated plastic filament has been available from GmbH (now germanreprap.com) since at least last year. Both this article's premise and content are terribly misleading. Sounds like a great initiative. I hope they gain enough interest in the community to make this project economically viable and able to count on these 3d printers eco friendly! These days, 3D printers can create just about anything - from human organs to deadly weapons. But one innovation we haven't previously seen in 3D printing? Printer filament made from of planet-friendly materials rather than Earth-damaging plastics. That's changing however, with design firm Emerging Objects' recycled and recyclable 3D printing materials. 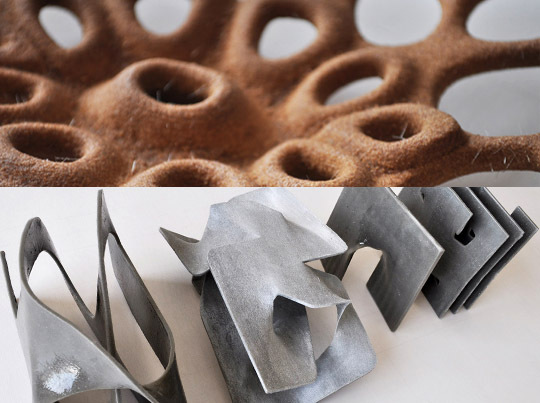 Using materials like salt, concrete, wood and paper, they are putting the green in 3D printing.